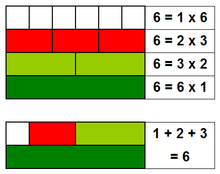 This article is about harmonic divisor numbers. For meanings of harmonic number, see harmonic number (disambiguation). 1, 6, 28, 140, 270, 496, 672, 1638, 2970, 6200, 8128, 8190 (sequence A001599 in the OEIS). 5 is an integer, making 140 a harmonic divisor number. where σi(n) is the sum of ith powers of the divisors of n: σ0 is the number of divisors, and σ1 is the sum of divisors (Cohen 1997). All of the terms in this formula are multiplicative, but not completely multiplicative. Therefore, the harmonic mean H(n) is also multiplicative. This means that, for any positive integer n, the harmonic mean H(n) can be expressed as the product of the harmonic means for the prime powers in the factorization of n.
For any integer M, as Ore observed, the product of the harmonic mean and arithmetic mean of its divisors equals M itself, as can be seen from the definitions. Therefore, M is harmonic, with harmonic mean of divisors k, if and only if the average of its divisors is the product of M with a unit fraction 1/k. Ore showed that every perfect number is harmonic. To see this, observe that the sum of the divisors of a perfect number M is exactly 2M; therefore, the average of the divisors is M(2/τ(M)), where τ(M) denotes the number of divisors of M. For any M, τ(M) is odd if and only if M is a square number, for otherwise each divisor d of M can be paired with a different divisor M/d. But, no perfect number can be a square: this follows from the known form of even perfect numbers and from the fact that odd perfect numbers (if they exist) must have a factor of the form qα where α ≡ 1 (mod 4). Therefore, for a perfect number M, τ(M) is even and the average of the divisors is the product of M with the unit fraction 2/τ(M); thus, M is a harmonic divisor number. Ore conjectured that no odd harmonic divisor numbers exist other than 1. If the conjecture is true, this would imply the nonexistence of odd perfect numbers. W. H. Mills (unpublished; see Muskat) showed that any odd harmonic divisor number above 1 must have a prime power factor greater than 107, and Cohen showed that any such number must have at least three different prime factors. Cohen & Sorli (2010) showed that there are no odd harmonic divisor numbers smaller than 1024. Cohen, Goto, and others starting with Ore himself have performed computer searches listing all small harmonic divisor numbers. From these results, lists are known of all harmonic divisor numbers up to 2×109, and all harmonic divisor numbers for which the harmonic mean of the divisors is at most 300. Bogomolny, Alexander. "An Identity Concerning Averages of Divisors of a Given Integer". Retrieved 2006-09-10. Cohen, Graeme L. (1997). "Numbers Whose Positive Divisors Have Small Integral Harmonic Mean" (PDF). Mathematics of Computation. 66 (218): 883–891. doi:10.1090/S0025-5718-97-00819-3. Cohen, Graeme L.; Sorli, Ronald M. (2010). "Odd harmonic numbers exceed 1024". Mathematics of Computation. 79 (272): 2451. doi:10.1090/S0025-5718-10-02337-9. ISSN 0025-5718. Goto, Takeshi. "(Ore's) Harmonic Numbers". Retrieved 2006-09-10. Guy, Richard K. (2004). Unsolved problems in number theory (3rd ed.). Springer-Verlag. B2. ISBN 978-0-387-20860-2. Zbl 1058.11001. Muskat, Joseph B. (1966). "On Divisors of Odd Perfect Numbers". Mathematics of Computation. 20 (93): 141–144. doi:10.2307/2004277. JSTOR 2004277. Ore, Øystein (1948). "On the averages of the divisors of a number". American Mathematical Monthly. 55 (10): 615–619. doi:10.2307/2305616. JSTOR 2305616. Weisstein, Eric W. "Harmonic Divisor Number". MathWorld. This page was last edited on 15 February 2019, at 20:27 (UTC).